As you will no doubt realise, I get a lot of emails on this subject. Whilst I value this correspondence greatly, I find it almost impossible to reply to every one. To save time and energy, I've started a FAQ on Minesweeper and the "P=NP"? question, and will update this list whenever possible. (It is currently in a fairly rudimentary state!). Any comments or contributions to this FAQ will be most welcome. Q: So what's it all about? Q: Please tell me where I can get a copy of your paper. A: The paper was published in the Mathematical Intelligencer (Springer Verlag, New York) Volume 22 number 2 (Spring 2000 ), pages 9--15. Its title is "Minesweeper is NP-complete". Q: Where can I get your paper on the web? A: I don't think you can. Try a library. Q: What other resources on the web are available concerning your result? A: There are some other papers you may like on this web site including a PDF presentation on minesweeper and a companion PDF paper entitled Some minesweeper configurations. Q: Where can I find out more about NP, NP-completeness and these issues? A: There are quite a lot of textbooks and research monographs in these areas. A quick trawl of amazon (for example) will bring up a few. A few that I liked include Garey and Johnson "Computers and Intractability", Hopcroft and Ullman "Introduction to Automata Theory, Languages and Computation", Papadimitriou "Computational Complexity", and Gibbons "Algorithmic Graph Theory". But there are many others, some putting a different slant on the problems. If anyone knows of goods web sites concerning NP-completeness, I would be interested to know, and will give links to them here. Q: What other games are known to be NP-hard/NP-complete? A: Garey and Johnson give a few of these: most of the ones they consider turn out to be NP-hard (at least) but may not in fact lie in NP themselves. Some are even PSPACE-complete, which is presumed (but not known to be) even harder than NP-complete problems. Familiar examples include the game of Draughts (also called "Checkers"!) on an arbitrarily large board: this is known to be PSPACE-hard, but not known to be in NP; The Japanese game of "Go" is also PSPACE-hard but not known to be in NP. 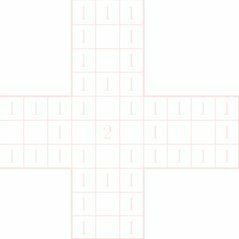 Another nice example is of crossword-puzzle generation. This (suitably formulated) turns out to be NP-complete. One correspondent asked me about battleships. As I understand "battleships", the question concerns whether it is possible to place a collection of "ships" on a square grid avoiding certain squares which have already been tested and found to be vacant. It is clearly in NP, and also contains the bin-packing problem as a special case, so is also NP-complete. Q: What is the Minesweeper Consistency Problem? A: This is a question one can ask about any particular rectangular grid with the squares decorated by numbers 0--8, mines, or left blank. It asks: is there a configuration of mines in the grid that would result in the pattern of symbols one sees (according to the usual Minesweeper rules)? The classes P and NP are certain classes of such problems (or specifications) with yes/no answers like this, and reformulating Minesweeper in terms of such a specification helps greatly in its analysis. By my result, the "P=NP"? question is equivalent to the question of whether there is a polynomial time algorithm that meets the specification in the Minesweeper Consistency Problem. For most "sensible" codings, the n just given is (within a polynomial) the same as the number of squares in the input configuration. For this reason, I usually think of n as the total number of squares, since the distinction really doesn't matter as we are only looking for algorithms that are (in time taken) polynomial in n. Similarly, if there are of the order sqrt(n) unknown squares (as is typical in my configurations in the paper i wrote) then "polynomial in n" and "polynomial in sqrt(n)" are essentially the same, so it's OK to think of n as the number of unknown squares if you prefer. Q: Has anyone seriously been using Minesweeper to solve the "P=NP?" question? A: As far as I know, the answer is no, but I would be delighted to hear otherwise. Q: What do I have to do to get the Clay Institute's $1000000 prize for the "P=NP?" question? Q: How can I solve the "P=NP?" question using Minesweeper? A: You will need to either show that there is no polynomial-time algorithm that solves the Minesweeper Consistency Problem, or else find an algorithm that solves it in time p(n) for some fixed polynomial p(x) where n is the number of squares in the input configuration and prove that your algorithm always returns the correct answer in this amount of time. Many algorithms I see work very nicely in most cases, but do not always guarantee to give an answer. Q: I have an algorithm for Minesweeper. Please tell me if I have proved P=NP. A: This request is quite common, and I have to be very careful here as I only have a polynomial-bounded amount of time! Because of pressures of time and my other commitments at work I have to say I am not interested in approximate algorithms or "practical algorithms that work most of the time". (Such algorithms are no help with P=NP? anway.) Please read the following very carefully, as I can only discuss your work with you if it falls into my area of interest and expertise. Please make sure that a long discussion will not be simply a time-waster, and that it is possible to communicate effectively. If, having read this, you are absolutely sure your work is within the area of interest I outline, and you understand all the issues concerning the problem as discussed on these pages, we can discuss it further. Firstly, I am interested in algorithms that solve what I call the "Minesweeper Consistency Problem". (See above.) In some sense this is equivalent to the problem of how to play Minesweeper "perfectly". But please address the Minesweeper Consistency Problem, not a different one. In particular your algorithm needs to be able to work on a r by s board FOR ANY VALUES OF r,s. A practical implementation of the algorithm will have time and space constraints due to the machine being used, but the algorithm itself must not have any such constraints. Here, I will use the letter n for the product rs, i.e., the number of squares on the board. Obviously n varies with the particular input and must NOT be regarded as "constant". - if I is "consistent" the algorithm returns the "yes" value taking no more than n^a + b units of time. - if I is not "consistent" the algorithm returns the "no" value taking no more than n^a + b units of time. Time can be measured as the number of single additions, multiplications or single machine-code instructions on a typical microprocessor. So, to multiply together two 8 bit integers to get a 16-bit integer is one step. But to multiply two integers with n bits each, or to find a determinant of an n x n matrix if you wish to do this, takes an amount of time that varies with n (and will depend on the paricular method you propose to use). Q: Do you have any good test cases or test data for algorithms? In electronic form, no. One way to build test cases is to build logic circuits in Minesweeper using the ideas from my original paper. I'm sorry I can't be more specific on this question. If any one has such a collection of data it could be interesting. Q: What about free-cell? Is it NP-complete? Does it always go out? A: I don't know the answer to either of these! For an NP-completeness result one would have to formulate a decision problem in terms of an arbitrarily large pack of cards, and I don't even know how one should do this. Q: What about Sokoban? Is it NP-complete? A: Sokoban is a really nice puzzle game invented, apparently, by Hiroyuki Imabayashi in 1982. See http://www.games4brains.de/sokoban_history.htm for more information. It was proved to be PSPACE-complete by Joseph Culbertson ('Sokoban is PSPACE-complete' http://web.cs.ualberta.ca/~joe/Abstracts/TR97-02.html). PSPACE-complete problems are generally regarded as being even harder in complexity that NP-complete problems (though the question "NP=PSPACE?" is also open and seems very hard too). Q: What about ...(some other game)? A: Many other games may also be NP-complete or NP-hard. Let me know if you spot anything interesting. Q: I'm interested in doing research in this sort of area. What should I be doing? A: Problems around "P=NP?" come up in many places, notably in the study of computability, computational complexity, and for a more practical side, combinatorial optimization. It is also possible to study algorithms in particular subjects such as graph theory, other branches of combinatorics, and also in number theory. Thanks to: Frank Reffel for information and useful contributions regarding this page. To Richard Kaye's main minesweeper page.